Caregivers face a unique set of challenges, including managingmoney matters. This indispensable new guide provides a sound actionplan for overcoming this formidable hurdle, offering practicalinformation, helpful tips, and invaluable advice on how tosuccessfully juggle personal finances with the cost of caring for aloved one. "A clear map through the many mazes of caregiving issues, withinformation on how they will affect the caregiver, the carerecipient, and their families. Guidance, good counsel, and help forall caregivers, from those thinking about caregiving to those juststarting and those who are veterans." --Louise G. Fradkin,cofounder, Children of Aging Parents. 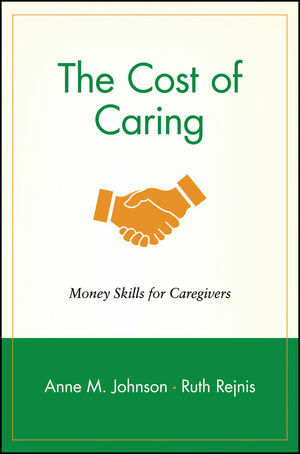 "If you find yourself in the role of caregiver to a loved one, TheCost of Caring is an excellent tool. Not only do the authors gothrough the ABCs of what you need to do and when, they provide youwith specific resources that can help you each step of the way. Iwill highly recommend it to my clients." --Mark Spangler, CFP,Former Chairman of the Board, National Association of PersonalFinancial Advisors. ANNE M. JOHNSON is the founder of Florida Care Giver magazine.Previously a healthcare reporter for the Jacksonville BusinessJournal, she has researched and written reports for the HealthPlanning Council of Northeast Florida and currently writes amonthly physician's newsletter for a major hospitalcorporation. RUTH REJNIS, formerly with the New York Times, has been a freelancejournalist for the past fifteen years. She is the author ofthirteen books, including The Complete Idiot's Guide to a GreatRetirement and Squeeze Your Home for Cash. THE PERSONAL SIDE OF CAREGIVING. Should You Be the Caregiver or the Caretaker? Moving? : Long-Distance Caregiving? : What's Best Right Now. Balancing Caregiving and Your Job. Taking Care of the Caregiver. YOUR FINANCIAL PICTURE--SHORT AND LONG--TERM. How Much Caregiving Can You Afford? How a Financial Planner Can Help You. The Ingredients of a Solid Estate Plan. And What About Your Savings? HELPING YOUR LOVED ONE WITH FINANCES. When It's Time to Leave Independence Behind. Your Loved One's Estate Plan. It's Free! (Or at Least Low Cost).